This bowl is rather small and thinly modelled by a skillful trimming. 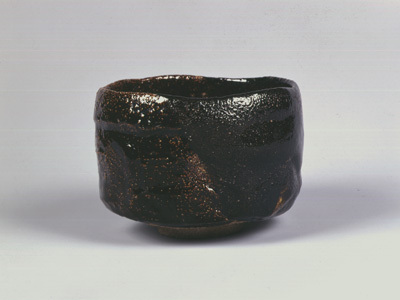 Two types of black glaze are separately applied on either side of the bowl. It is representative of the style of Keinyû characterized by a sophisticated artifice. Inside the foot is marked with Keinyû's seal of his mid-career that spans between 38 and 55 years old. A dynamic use of the spatula to model the shape is overall visible. The piece is endowed with youthful energy and freshness of quality. It is presumably made when the artist was in his 40's. 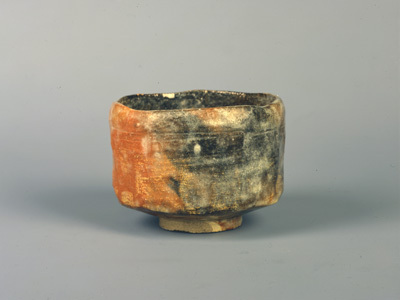 This piece is the largest example of Raku ware. 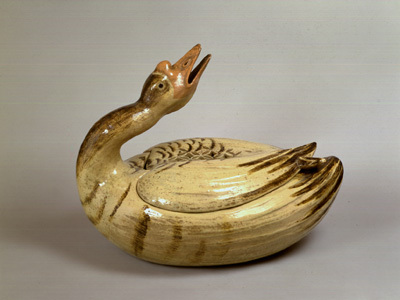 Keinyû domesticated a goose at home when he was producing this piece. It is surprisingly realistic in details capturing a vivid expression of a goose in real life.